Those are excellent. There are some great details and images there. Is that pretty much your setup, Craig? The thing that most fascinates me about these is the degree of mechanization and details of the water hammer technology. The only thing that puzzles me is that I don't see how they would disengage a hammer from the cog when not in use. Maybe they didn't, just letting them run, though that would seem to create undo wear on the tools. Maybe there's some sort of clutch mechanism on the wheel, or a way to redirect the flow of water. I would guess (based on the remains of water and wind mills I've walked past) that the hammer is on some kind of pivot. Or there is an intermediary step which isn't illustrated which is on a pivot / capable of being moved out of alignment. The only problem I can come up with on the whole "simple pivot" idea is that those hammers must be very heavy. Otherwise there wouldn't be a water wheel on the other end So even movement around a pivot is going to be difficult. I now have an urge to go build a life-size model to try and work out the solution... Gah! All you need is something to brace the hammer up and its free of the cog. It could be under the hammer face or even a bar near the pivot of the hammer arm or a hook over the end near the cog. I have seen all used in varying configurations. So obvious...now that you've said it. 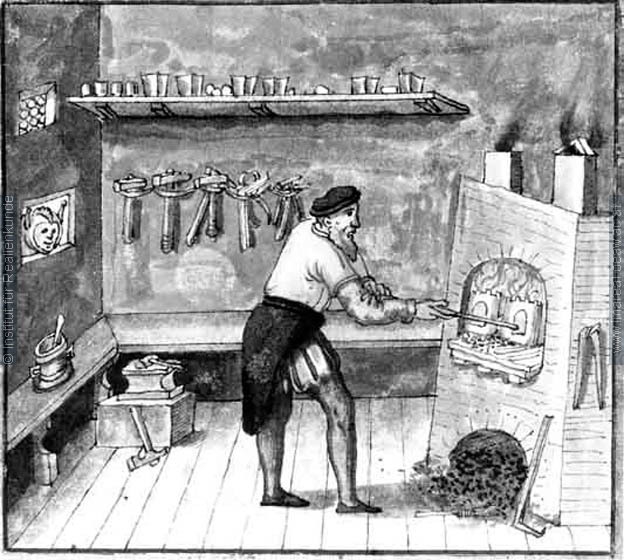 A few days ago I stumbled upon this link which shows a reproduction of a medieval blacksmith's workshop. According to the text, the sluice is controlled by a lever inside the shop. Thanks for these images Sean, I'm particularly interested in the low anvils and forging whilst seated. Personally, I can't be bothered sitting down to forge as I'll only have to stand up 20 seconds later to take another heat on the steel. I do most of my armouring seated but that's only when working cold. Most fascinating. There seems to be a great deal of similarity to modern smithys. The fire rakes are basically the same and there are what appear to be spring fullers hanging on the wall in the first picture. My two biggest questions are, how do the water driven bellows work in the last picture, and what are they working on in the fourth picture? 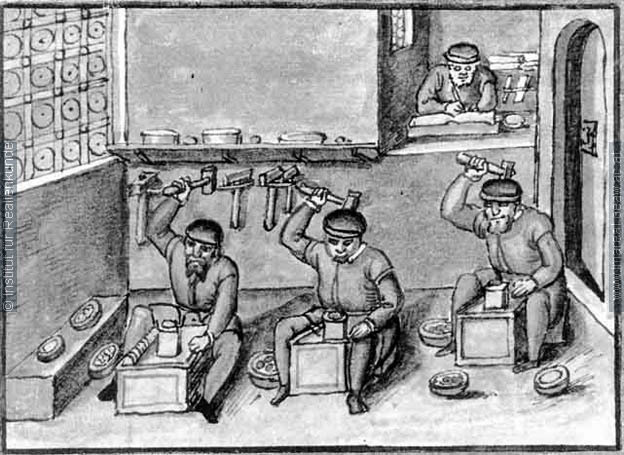 They appear to me to be cracking walnuts (note the bowls on the floor). That last picture you posted Craig is great. I particularly like the slots for interchangeable tools on the anvil and hammer. I have worked and still go working into such water hamemr forges. 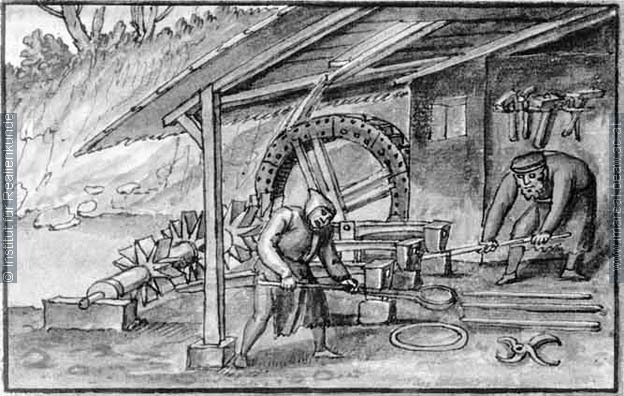 Mechanism is not complex, there is no disengaging, simply a lever stops water falling or disegnages the waterwheel from the machine. I almost got crushed last saturday when i tried to restart one by tampering with a non perfectly registered mechanism, ahem. I have plenty of pics somewhere. 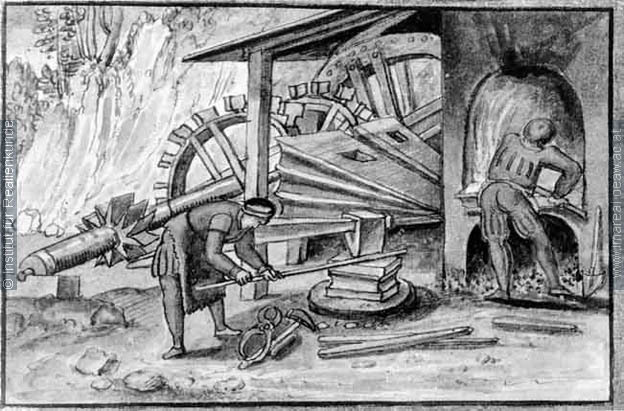 the forges i was were built in the XV century and in 1572, respectively, also i worked in anotehr from the XVII. Exactly equal in principle and mechanism. Would love to see some of the pics if you are able. This has sort of been said already, but to elaborate; There is a forked wooden crutch that goes under the neck of the tilthammer when it is un its upstroke that was used in some mills to disengage the hammer. You obviously need to push the head up a little to fully disengage it, but most of the weight is held on the pivot anyway. A good gallery with two magli in working order from the province of Brescia. The old man with a shovel is a 92 year old maister (master smith), Severino Zola, who has been working there from 1930 to 1980 making spades, shovels, pickaxes and other agricultural tools. The forge is ancient, some part are clearly medieval, the anvil with a single cone bears a striking resemblance to single cone early anvils. He worked using stamping tools quite similar to that shown on old woodcuts. Grindstone is from our area. 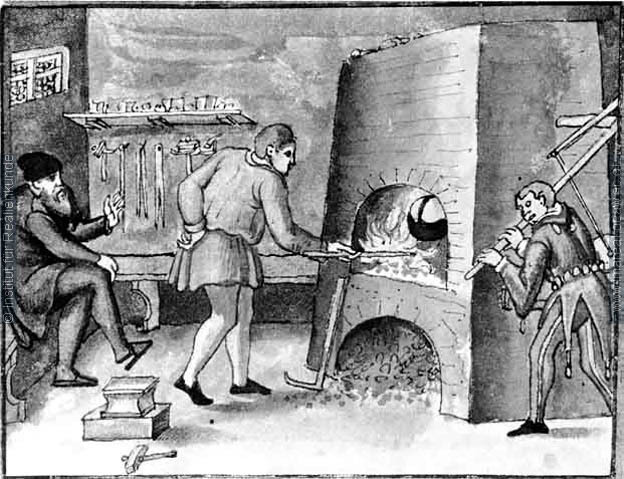 There was also a special maglio for finishing items, and he used to forge weld handles to shovels using a local powder made out of special flint (saless). The smaller maglio is in Brescia and it is placed in the neighbourood that produced most of the brescian swords. The grindstones I shot that are covered with a green patina are probably from an ancient period, now they are sued to support a newer maglio channel. Likely they come from the moladore, wooden scaffoldings used in the sword process that are recorded in the 1610 census. I will be working as a volunteer in the smaller maglio from the next season. The date on the maglio's stone shoulders read 187* but I have seen far older ones (at least 1525 in another forge). Maister Zola reported that they knew that in ancient times such shoulders were made out of wood as theya are called soche, from soc, stump (cfr the french socle). Pics are heavy and unedited, pls use for personal, non profit use only. I'm planning an in depth book on the brescian process so they will likely be included. Incredible Bruno, great pictures. I have not made it through all but have seen some great things. I look forward to your book in the future. These are very interesting and have great details. Couple of years ago I saw a video of traditional Brescian bucket makers and was very impressed. This looks like the type of experience where you will learn a lot. Youa re welcome, I had a great time myself listening to that old master. He told me he started working at 11 as lever operator in 1930 (the boy who acted as maglio starter/stopper, and ceased in 1980. His work routine was: wake up at 2 am, work until 8, a quarter hour pause for a brief lunch1, then back to work until midday. Afrer a couple hours rest, back to finishing work. Such people could throw out a hundred finished pieces a day or more. Unlike others who turned undustrialists in the fifties by establishing modern style steel mills he continued to work the traditional way, so that today he lives out of a meager pension.